If prayers were music, what would they sound like? 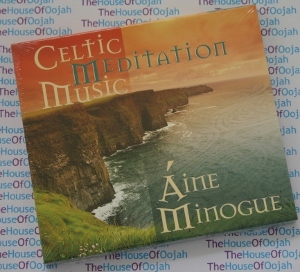 Irish harpist Aine Minogue offers her artful answer on Celtic Meditation Musica collection of original songs based on ancient Celtic prayers, specifically composed for meditation and relaxation. Using traditional poetry as divine inspiration, she crafts expressive and dynamic songs that transpose the silent spaces between the lines of Celtic prayer into melody. As traditional Irish music and dance continue to enjoy phenomenal success both here and in Ireland, Áine Minogue is an artist who has long explored its themes and who captures its very essence. Her voice reflects the lyricism and richness to be found in Irish music, mythology and poetry with a voice undeniably her own and a diverse group of instruments that add to the traditional flavor of her work. Born in Borrisokane, County Tipperary, Áine's large musical family encouraged her to pursue a number of different instruments during her youth (which explains her obvious skill at arranging). They played together as a family and attended fleadhs (traditional music festivals). But it was at the age of twelve while at boarding school in County Galway that Áine discovered her true love - the harp - which she decided to pursue in lieu of the others. After completing school she spent three years developing her talent as a harpist at Bunratty Castle, County Clare, then moved to the United States, settling in New England.